An Introduction to this Cruise. 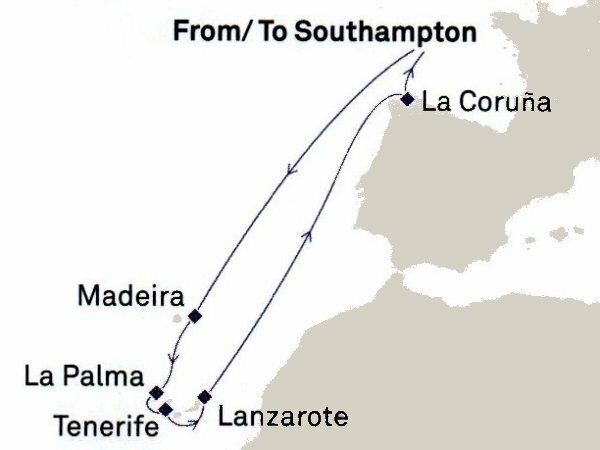 This 12 night cruise for Christmas had a relatively large number of 'port days', calling at Madeira, La Palma, Tenerife, Lanzarote and La Coruña, giving a restricted time to write up. We spent Christmas Day at sea between Lanzarote and La Coruña and were back home for the New Year. Most of the ports we have visited several times on similar cruises to the Canaries or whilst starting and finishing cruises in the Mediterranean. We spent most of our time on foot in those ports - five hours on average! Lanzarote was the exception as we took a tour. We had been to the "Fire Mountain" once before but a long time ago, we guess over 25 years. The tour was good and also included visits to a winery and an Aloe Vera factory which was more interesting than we expected. It was a Sunday and previous experiences were that the capital Arrecife is deserted on Sundays and one is lucky to even find an ice-cream or tourist shop! The Christmas theme. Much of our time ashore had a Christmas theme and we visited many Spanish churches which were all highly decorated for Christmas with many of the statues dressed in rich robes. Some had nativity scenes within the churches and we took many pictures with a Religious and Christmas theme within and outside the churches including decorated streets of the metal pyramid style Christmas trees. We always visit the local markets and again we have additional pictures reflecting some of the extras available in the Christmas period which we have added to the standard introductory write-ups of ports. The Theme of Beléns - is a fascinating part of the Christmas theme. We made a special point of seeking out Beléns which are extravagant Nativity Displays. We knew little about their importance to the Spanish culture previously so it is worth giving a little background on an area which turned out to be one of our major interests in this holiday. A Belén is a primarily a Spanish Nativity scene although they occur in several other areas. Belén translates as Bethlehem and the Spanish Nativity scene often includes most of the town of Bethlehem and what often seems to be much of the rest of Judea. In addition to wise men, angels and shepherds, there are farmers with their ploughs, hunters with strings of game, washer-women washing and bakers baking and potters turning, often in motion. There are caves and houses and temples, rocks and streams and mountains. Off in the distance, there are the Magi on their camels, and sometimes you will see the soldiers of Herod, ominously advancing with their swords drawn. Normal people and children fill the the scenes, bringing their offerings to the Jesus, sleeping in a straw-filled manger under the gaze of the adoring Mary and Joseph. The tradition is a very old one going back to the 13th Century. It is said that St. Francis creating the first nativity scenes but it is likely he was inspired by earlier traditions of modeling religious scenes. Christmas, of course, had its foundations long before Christianity, it was a feast close to the winter solstice that had been celebrated not only by the Romans but by other pagan peoples and had significance as the point at which the darkest day occurred and then the days got longer. Christianity then spread through lands that had a long tradition of religious imagery, and paintings and carvings began to appear with earlier images which were reinterpreted by Christian artists, just as pagan feasts were reinterpreted by the Church and the modern Belén has many flexible interpretations on an underlying religious theme. Now many extravagant variations based on local art, culture and faith can now be seen every Christmas throughout Spain and the Spanish New World. Several towns now have Belén trails for people to follow and there are many shops where one can buy figures for your own Belén. Many of the Belén we saw were huge with complex scenes with figures made over many years. Some had scenes built by the various parishes in the region, both separate in style yet integrated into the whole. Most of the large ones we found were not in churches but were in town halls or in public parks. One was in a private residence where the owner had been collecting old figures through the years and another on a beach with larger than life sculptures in sand. Many of the models are moving with streams running with waterwheels turning and fishermen raising and lowering their rods. Some scenes are relatively modern and represent various businesses in the area and parts are quite amusing - we saw one scene where the wise men on their camels are being halted at the entry to the local camel parking to pay their well laid out parking fees. Many of the figures are modeled on local and famous people, We saw Picasso painting one of the local celebrities.